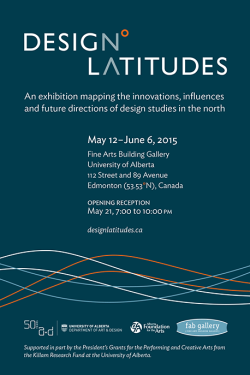 Design Latitudes is an exhibition mapping the innovations, influences and future directions of design studies in the north. The exhibition ran from May 12 to June 6, 2015 at the Fine Arts Building Gallery on the University of Alberta campus and showcases 59 submissions. The opening reception was on Thursday May 21, 2015. Learn more about the Design Latitudes. 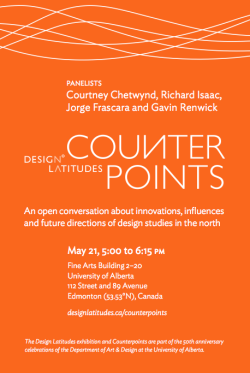 The Counterpoints panel discussion is an open conversation about innovations, influences and future directions of design studies in the north. Our panelists were Courtney Chetwynd, Jorge Frascara, Richard Isaac, and Gavin Renwick. The panel discussion was on Thursday May 21, from 5:00 to 6:15pm in 2–20 Fine Arts Building at the University of Alberta. Audience members were invited to ask the panelists questions. Tweet or instagram us at #designlatitudes.